He means it, you suspect, but nonetheless Ivory Wave singer, George Johnson, says it more than once: “this has been the best night of our lives….”. It has certainly been a landmark moment in the hometown lads’ fledgling career. 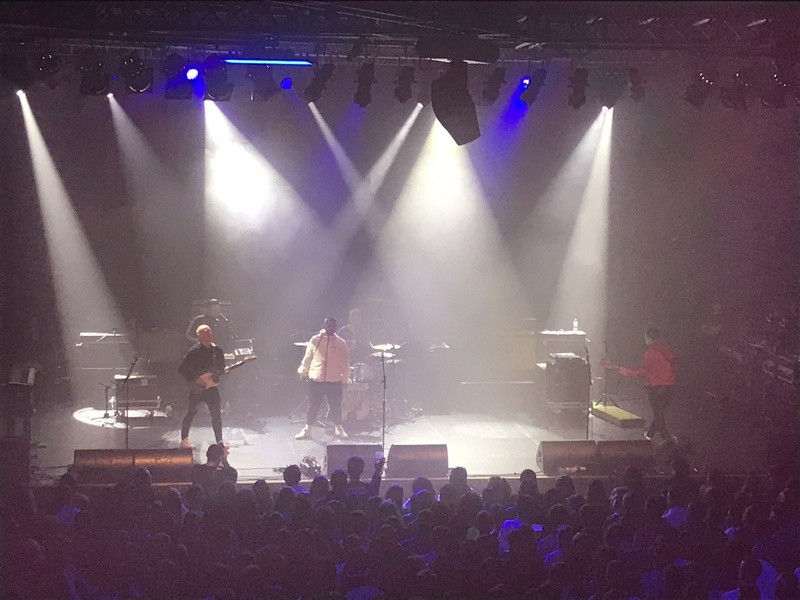 With a sound that recalls the pilled up 80s flavours of Happy Mondays, but also Brummie near-next-big-things The Twang, they play their way through an entertaining half hour, including “Gold”, but also a new song, played for the first time this evening. Relatively older stuff like “Cool Kids” boasts a catchy hook and “Separate Beat” puts Rob Clarke’s synth right to the fore to give it a euphoric feel. They end with “Club” and they were probably straight into one after the show given the party mood they’d been in. There is every reason to think that this is a night that Ivory Wave could top, however. Speaking of Wave’s, DMA’s are riding one. Their triumphant UK run last year has been quickly followed with these gigs, and although not quite sold out here, there is a palpable sense of anticipation amongst the almost football style crowd as they appear. As if to emphasise the point a flare is let off as “Dawning”, well, dawns, and with that they’re off and running, and there’s 1000 or so of their rabid nearest and dearest who are hanging on every word. It is interesting that live, DMA’s are – literally – a different band than they are on their records. Six of them on stage is double the number in the studio and the beefed-up sound helps work like “Laced” hit home superbly. “Melbourne” concludes in a swirl of feedback, an almost hypnotic feel descends, and it helps immensely that they’ve got their very own, ready-made, stadium shaking anthem with “In The Air”. Fists proudly go skywards and the mobile torch lights shine. But if this has genuine crossover appeal, then it is far from the only one. “Time And Money” and “Step Up The Morphine” fall into this category. This, though is a varied mix, and that the band have the courage to slow things down for an acoustic portion of “The End” – which works brilliantly – is testament to firstly their abilities, but also the way it received is proof, if it were still needed that this is an outfit who has a connection with their audience that is the envy of many. “Delete” builds slowly, with the three live members reappearing half way through, and if “Emily Whyte” and “Play It Out” are tumultuous, then everything plays second fiddle to the encore. Often, you’ll see a band who has no idea how to pace a show and it ends with a whimper, when a crescendo is required. That’s not the case here. Instead fan favourite “Tape Deck Sick” (which only made its live debut the night before) is followed by a pummelling “Feels Like 37” and an almost punk rock “Lay Down”. The latter heralds more flares, and the type of scenes that only bands on the cusp of being massive can engender. A band that lets their music speak for them, singer Tommy only talks to say “hello” and “thank you”, and there are no political rants here. 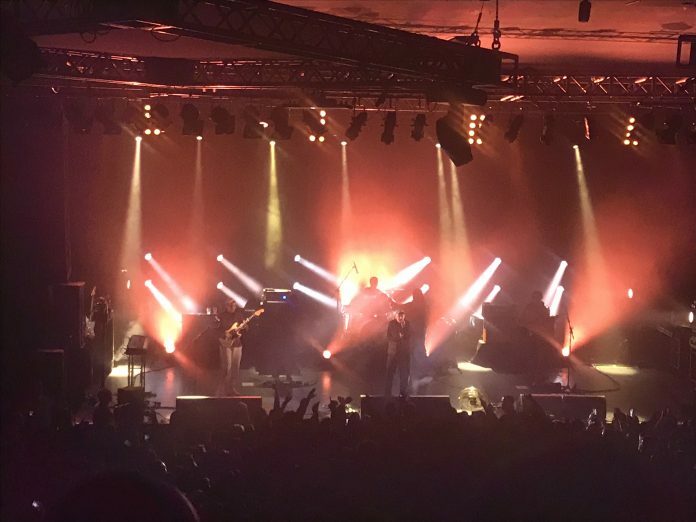 What is undeniable though, is that however understated they might be, DMA’s clearly have something special.